Regarded as a partial return to form for its legendary director Woody Allen upon its cinematic release last year, Midnight in Paris (2011) also stands as his most successful work to date at the box office. Starring Owen Wilson as the now customary Allen cipher, the film follows Hollywood screenwriter Gil Pender as he travels to Paris with his fiancee Inez (Rachel McAdams) in search of inspiration for his first novel. After being whisked away to an apparent 1920s-themed party during a drunken midnight stroll, Gil soon finds himself rubbing shoulders with 20s icons including F.Scott Fitzgerald, Ernest Hemingway and Salvador Dali. If you can suspend your belief beyond the high concept MacGuffin at the centre of the film (each night as the witching hour arrives, Gil is inexplicably thrown back into Paris’ hedonistic past), then there is much to enjoy in Allen’s latest effort. Wilson’s Allen impression is initially irksome, but once you get over the flapping hands and baggy chinos, the character of Pender begins to come into his own. Gil’s personal conflict is that he believes himself to have been ‘born late’, inhabiting an era that simply doesn’t match his own personal tastes and artistic ambition. Magically thrown back into the Paris of the 20s, Gil fits right in amongst the well-to-do Scott and Zelda Fitzgerald (elegantly played by Tom Hiddleston and Alison Pill), Corey Stoll’s dashing Hemingway, Kathy Bates’ Gertrude Stein and Adrien Brody’s Rhinoceros-obsessed Dali. In truth, these caricatures provide some of Midnight in Paris’ very best moments, with Allen creating a number of wonderfully self-referential discussions between Gil and his idols (upon meeting surrealist filmmaker Luis Buñuel, Gil knowingly plants the seed for The Exterminating Angel – in which a group of bourgeois types find themselves inexplicably stuck in a room – to which Buñuel responds “But why can’t they leave? I don’t understand.”). Allen has also brought together one of the finest ensemble cast of recent years, with the birdlike Marion Cotillard (next seen this year as Miranda Tate in Christopher Nolan’s The Dark Knight Rises), French first lady Carla Bruni and Welshman Michael Sheen also making noticeable, if not groundbreaking appearances. The real issue with Midnight in Paris revolves around the modern day sections of the film, as Gil frantically tries to escape his prissy wife-to-be and her Republican-leaning parents, more interested in guzzling Californian wine then sinking into Paris’ backstreets. Much like Gil, Allen seems disconnected with contemporary life and seems unable to draw realistic, emotive characters. As the film winds down to its conclusion, the modern day cast predictably splits into two groups: the whimsically liberals and the closed-minded conservatives. 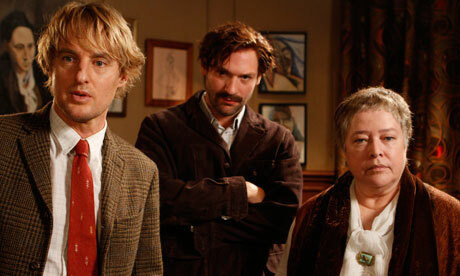 As a light and fluffy rom-com, Midnight in Paris stands out as one of the stronger efforts of 2011. Yet as a potential Academy Award winner – with the film nominated for a total of four Oscars including Best Picture and Best Director – its flawed plot and humdrum contemporary sequences will leave most reaching for Allen’s extensive back catalogue.